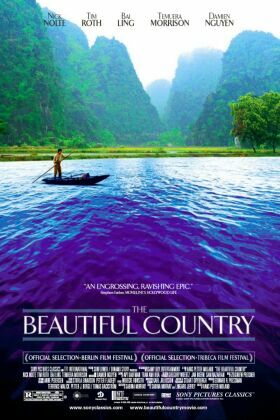 The Beautiful Country by the Norwegian director, Hans Petter Moland, is a movie where the story does most of the work and the director seems, for the most part, to be trying to keep out of its way. Mind you, it’s hard to see quite what else he could have done, for it is a very powerful story. Moreover, the historical and political background, not only of the war in Vietnam but of the twilight world of illegal immigration and the exploitation of immigrant labor by a particularly nasty set of criminal entrepreneurs in our own time also tends to dwarf the film’s human story and make its characters into mere victims rather than fully-realized human beings. With so much of what it has to say already determined by the nature of the material, it is remarkable that the film is as successful as it is in making us care about its central figure. This is Binh (Damien Nguyen), the Vietnamese son of an American GI father. "He was here one day and then he was gone," Binh’s mother, Mai (Chau Thi Kim Xuan), tells him. "Just like that." "He was just gone. It was a hard time for everyone." Especially hard, of course, for women like Mai who had borne children to American fathers whom, after the fall of South Vietnam, they were unable to contact. Mai and her American were at least married, and in church. She has the papers to prove it. But this means nothing to the prejudice of the Vietnamese against children such as Binh, who has "the face of the enemy." Such children in post-war and Communist Vietnam — an estimated 12,000 to 18,000 of them — were treated as Bui Doi: "less than dust." Mai had sent Binh into the country to be raised by relatives and herself remained in Ho Chi Minh City where at the time the film is set, 1990, she is working as a servant for a rich family. When circumstances make it necessary for Binh to leave his home in the country, he goes to the city to find her. The rich family treat Mai abominably, and Binh finds that he has a little half brother, Tam (Tran Dang Quoc Thinh), probably the son of her employer. She finds Binh a job with her in "the big house," but an accident soon makes it expedient for him to leave town. Mai gives him her small savings and bids him take Tam and go to America. The two thus join the hundreds of thousands of "Boat People" who fled Vietnam between the late 1970s and early 1990s and who, if they were not drowned, starved or murdered by pirates first, usually ended up behind barbed wire in refugee camps in Malaysia or Hong Kong. Some eventually made it to America. Binh’s story, therefore, is already a familiar one, and it is made more so by becoming a quest for his father — which long traditions of story-telling have made into a self-explanatory endeavor requiring little in the way of psychological elucidation. In addition to these well-traveled narrative pathways, the film sets down a third. For the various appalling experiences undergone by Binh and Tam and a young Chinese woman (Bai Ling) they meet in a Malaysian refugee camp have the look of being in a showcase — like Beyond Borders, the Angelina Jolie vehicle of a couple of years ago — designed to impress us with the seriousness of "the refugee problem." I’m afraid that all this familiarity rather overwhelms our attempts to get to know Binh as an individual. He is a brave and attractive figure, but he seems swept away on these three powerful narrative currents even more than he is on the treacherous waters of the South China Sea. He is as much an enigma at the end as the beginning. There is a similarly one-dimensional quality to characters played by Tim Roth and Temuera Morrison — the two most notable bad guys. The one moment where Binh seems to come alive for us happens after months of indentured servitude in New York when he learns by chance of a US government program that would have brought him to America by air without charge. All his sufferings, in other words, have been unnecessary. "You lie! You lie!" he shouts, desperately unwilling to believe it. Later, after Nick Nolte makes a late and somewhat unsatisfactory appearance as his long-lost father, Binh tells him, in answer to his question, that he has not had much trouble effecting their reunion. That remark seems to me to redeem, in its small way, the whole film, rendering insignificant the rather formulaic quality of Binh’s trials and tribulations just as they themselves are redeemed by his recovery of his father.